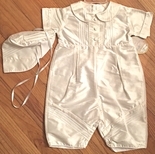 Baby Boy's White Day Gown With Blue Embroidery By Maria Elena. 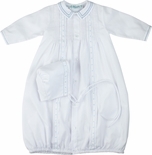 Baby Boy's Smocked White Day Gown With Blue Accents by Maria Elena. 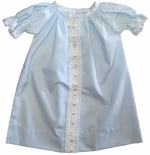 Baby Boy's Smocked White Day Gown With Blue Dots by Maria Elena. 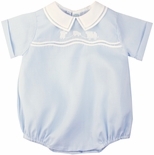 Baby Boy's Smocked White Day Gown With Blue Sailboats by Maria Elena. Petit Ami Boy's Smocked Shortall And Matching Hat. Feltman Brothers Bubble for Boys in Blue with Embroidered Train. 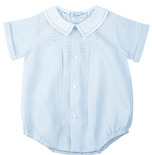 Feltman Brothers Baby Boy's Sailor Romper Bubble. 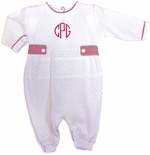 Feltman Brothers Boy's White And Yellow Romper Bubble. Feltman Brothers Baby Boy's Trains Bubble in White or Blue. Feltman Brothers Baby Boy's Rocking Horses Romper Bubble. Feltman Brothers Gown for Bringing Baby Boy Home, Day Gown. Rosalina Boy's Monogrammable Long Sleeve Blouse Body Suit.